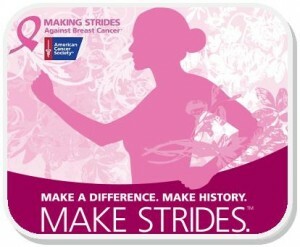 LANCASTER – Ladies First Fitness & Spa is donating 500 one-month free membership passes to breast cancer survivors who participate in the inaugural Making Strides Against Breast Cancer 5K this Saturday. The noncompetitive walk, held in conjunction with National Breast Cancer Awareness Month, is scheduled for Saturday, October 19 at the Palmdale Amphitheatre/Marie Kerr Park, located at 2723 W. Rancho Vista Blvd. Registration begins at 7 a.m., and the walk starts at 8 a.m. To join a team, to register your own team, or to donate to this event, click here. Ladies First Fitness will be donating one-month membership passes to breast cancer survivors taking part in the walk, as well as anyone who sponsors or donates a minimum of $25 to the Antelope Valley event. Funds raised from the walk will help the American Cancer Society provide free information and services for those living with breast cancer in the Antelope Valley. “As an all-women’s facility, most of us have known someone who has been affected by breast cancer, whether it’s someone we know who has struggled and beat the disease, or someone who has fallen to it,” said Christina Buchanan, manager of Ladies First Fitness & Spa. “We have all been affected by breast cancer in some way and we feel very strongly in supporting this cause,” Buchanan continued. Ladies First Fitness & Spa is also donating a gift basket valued at $1,000, which includes a one-year gym membership, childcare, tanning, aqua massage and a gym bag. Additionally, trainers from the gym will host a 5-10 minute warm-up session just before the walk. “Regardless as to whether you are a member of a gym or not, you need to do something physical every day,” concluded McBroom. Ladies First Fitness & Spa is a full-service gym and day spa, located at 42015 10th Street West in Lancaster. For more information, visit www.ladiesfirstrocks.com or contact manager Christina Buchanan at 800-518-1418. For more information on the Antelope Valley’s inaugural Making Strides against Breast Cancer event, click here or contact Jo Ann Baker at 661-221-0293.